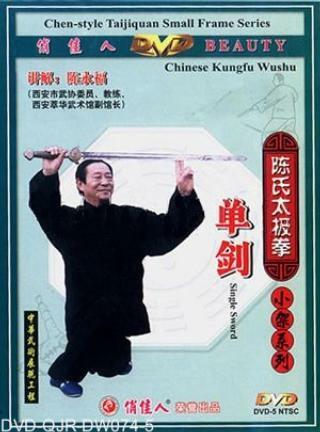 Taiji Single Sword is one of the short weapons of Chen-style Taiji Quan. It has 49 forms, which are reasonable in arrangement and compact in cohesion. The sword methods are clear, with stab, chop, uppercut, parry, point, slice, support, block, sweep, intercept, thrust, push, combining extensive and elegant body form, agile and stable foot method, and with inflexibility and yielding, concealed and appeared, follow-up with sticking and attaching, in addition, the various changes, truly represents the features of Chen-style Taiji Sword that operates the sword with the whole body, continuously and roundly, combing hardness and softness, equaling stress the quickness and slowness, changing the crook and the stretch. To practice the Chen-style Taiji Sword, you should use the Taijiquan as the base, pay attention to that you must use the mind to guide the Qi, and the force is focused at the tip of sword, so that the weapon and body move naturally as a whole.